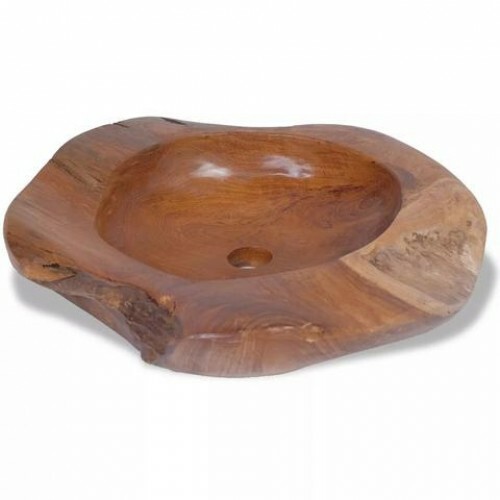 This unique wash basin, made of solid teak with a water-repellent finish, exudes a rustic charm and is a real eye-catcher in your bathroom or washroom. It should be mounted above counter. This striking basin is not only a practical sink for everyday use, but also an adornment for your living space. It is fully handmade and the craftsmanship adds to its spectacular retro and natural style. It will definitely suit any interior style. In addition, the basin is very easy to clean. Important note: As wood is a natural product, the colours, grain patterns and shapes vary from piece to piece, making each of our wash basins unique and different from the next. The delivery is random.